Due to the Caracal’s geographical distribution that ranges over a wide range of environments, the animal experiences different threats and thus has a variety of population trends. The species is considered as “Least Concerned” (LC) in the Arabian Peninsula (Mallon and Budd 2011) but contrary, it has already vanished in Kuwait (Cowan 2013) and is on the verge of extinction in North Africa (Cuzin 2003, F. Belbachir, pers. comm. 2014). Fortunately for southern Africa (Thorn et al. 2011), the species seems to be stable. 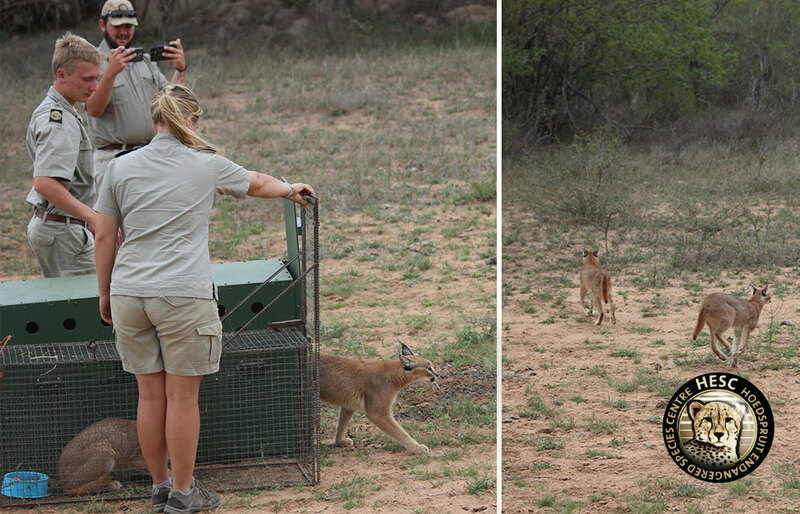 The Hoedspruit Endangered Species Centre (HESC) received a call regarding two Caracals, a female and male. These two were surrendered from Nature Conservation after their living conditions were found to be substandard. The pair of Caracals were brought to HESC to be released, but not before their behavior was carefully monitored and the state of their health established. Linri, the HESC head curator, was overseeing and monitoring the Caracals with the help of Gary Jenkins and Duncan Bothma. On 10 December, when satisfied, they were caught and loaded onto the animal vehicle and driven to the chosen spot on Kapama Private Game Reserve. Both animals were placed next to each other and without a moment’s resistance the doors were opened. HESC staff described it as a remarkable sight to see them head back into nature, where they belong.